A new season brings a new round of fashion. If you, like this unseasonal weather, are hanging onto summer, here are five shoes and boots that might just have you switching to the dark side: winter. Platforms made it back onto every woman’s must have list and this love of all things high hasn’t show signs of abating any time soon. The court is a classic shoe and goes with pretty much anything. However, if you want to spice yours up a little, you need to look at the details and play with color and materials. Despite the fact it’s winter, peep toes are a big deal this season. They are just that little bit sexier than standard styles and look great with a contrasting colour nail polish. If you really want to push the boat out, a pair of metallic courts, complete with shiny patent or snakeskin effect will definitely have you ready for the Christmas party season. With this on-going love of all things seventies, wedges are hanging on from summer. However, they are now more shoe-boot like and come in suede with a decent amount of studding and embellishment. Elegant and ladylike, riding boots are making a big impact on the winter fashion scene. They work just as well with skirts and dresses as they do with trousers and jeans. Straps and two-tone effect are very on trend; either black or warm brown works best or alternatively you can mix the two and work in a version of colour blocking. 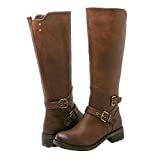 House of Fraser ladies boots collect is great this winter and some simply amazing riding boot styles to choose from. The shoe boot is the perfect winter shoe, or is that boot? Combining the sleek styling of a shoe with the more practical side of boots, these shoes are cute and edgy. Lace-up styles reminiscent of Victorian women’s boots but with a stiletto heel are very on trend this season. Look for a slightly platformed sole, narrow heel and suede or leather. The odd bit of brogueing or tassels won’t go unnoticed either. Loafers are the new ballet pumps. Boasting a thicker sole, they are far better suited to winter. Moccasin styles are more casual whilst buckled and patent versions are better with more formal outfits. These look great with jeans and dresses and slot in nicely to the 1960s trend this winter. Can’t afford new shoes? Buy shoes now, pay later! Christine is a freelance blogger and footwear enthusiast who is constantly looking for new informative materials to help you find the perfect shoes and shoe deals.